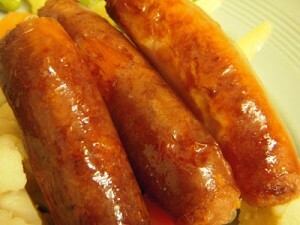 Our man in Kings Lynn has bravely reviewed Richmond’s Fresh Thick Sausage. 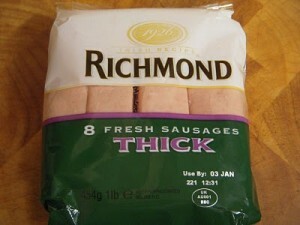 Richmond’s are a ubiquitous low-price sausage that you’ll find nearly everywhere. Even their website is suspiciously banal and lacking in interest. 42%. That’s right, Forty. Two. Percent. Dear sausage fan, please allow me to take you back a couple of weeks in this blog’s history, to a link contained in the review of Sainsburys-Taste-The-Difference . It was a great piece by Felicity Lawrence and if you didn’t read it first time, here’s another chance: Backfat-Article . The absolute relevance of this article to Richmond’s meat tubes struck me like a sledgehammer. 42% – I’ve seen that somewhere else……if you can’t be arsed clicking the link, Felicity wrote “The food standards agency has proposed new rules to require clearer labelling of meat content, so that added fat, offal, gristle and rind would have to be separately identified and shoppers could tell more easily what they are getting. The move has been welcomed by consumer groups but they are also worried. The proposals will lower the legal minimum meat content, so that pork sausages would only have to contain 42% meat as newly defined.” So it appears that the Richmonds are adhering – to the decimal point – to the new rule. Average. Well, actually, NOT average. These tasted like the kind of thing that Generic Family Gastro Pub Chain offers as part of the Kids’ Sausage, Chips & Beans meal, £1.49. Not actually unpleasant, but not in the same postcode as most of the sausages tested already. Not even on the same continent. A bit mushy. Not that firm. Rather under-chunky. The filling could be cut through using a strand of cooked spaghetti.. The casing however….Ladies And Gentlemen Of The Jury! I refer you once again to the Expert Witness Statement of Felicity Lawrence! Check back yet again to her article if you want to, but here is the telling portion: “sugar in the form of dextrose to make them go brown when cooked”. I think she’s, once again, hit the nail on the head. Check out the photo of the Cooked Richmonds. They are all, uniformly, brown. 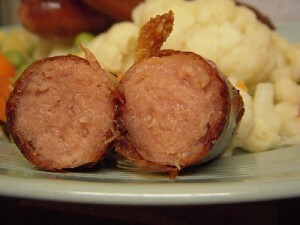 Now check the photos of all the other sausages. They are NOT uniformly brown. Every sausage has been cooked in the same way, and I believe that “all the others” are a more accurate reflection of…..sausage-ness?? ?….than the Richmonds. Felicity seems to be spot on, they must have dextrose, or something very similar, to make them turn such an obvious over-brown colour, reminiscent of a Wisbech granny on a night out at Doctor Thirsty‘s. Sure, it cooked to a decently semi-tough skin that gave that nice feeling under the knife, but it’s a hollow claim for praise. £1.97 per pack, weighing 454g – this works out as a price of £4.34 per kg, or 25p per snorker. Cheap. You gets what you pays for. A truly awful sausage. I would even feed them to my dog! It’s an insult to even call them sausages. Oops, meant to say I wouldn’t feed it to my dog. Thanks for correcting that – If you fed them to the dog i would have to report you to the rspca. Richmond sausages are only fit for the bin. This must be one of the most revolting things I have ever eaten. Not completely surprising when you look at the ingredients. 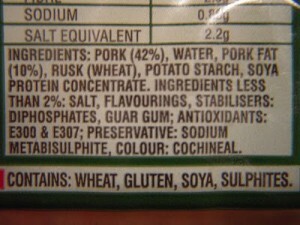 42% ‘pork’ is just a ludicously low meat content, especially when the pack was pre priced at £2.49. Unfortunately these were the only sausages left in the village shop when my 9 yr old went breakfast shopping on Sunday, so these are what he bought back with him. I felt obliged to cook them up because of the cost and effort involved in the purchase. I only managed to eat half of one. It was spongy, mushy, and very unsausagey. It really was quite vile. £2.49 should be premium sausage money. I even felt guilty about giving them to my dogs because they were so disgusting. 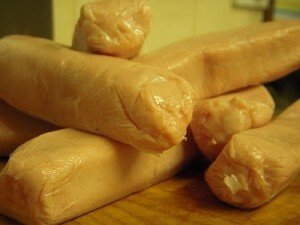 The truth is sausages such as these should be allowed to be sold for consumption by anybody, whether they are human or dog. Richmond is synonymous with the highest quality bangers — gracing tables up and down the country at teatime. We’re as proud of Richmond sausages today as we’ve ever been — their unmatched quality has stood the test of time and they’ll be a family favourite for years to come. I have never heard such a load of complete and utter rubbish. The description on the pack is just as misleading: ‘Delicious’? – Haha I don’t think so!